February 11, 2019 February 3, 2019 / Elizabeth T.
It’s officially February, and needless to say, I’m pretty much over this whole winter thing… Aren’t you?! On a more serious note, here are my go-to pieces when I’m just a little tired (and very much bored) of winter fashion! I’m still trying to stay cozy, but this easy outfit formula has definitely helped to make my ensembles a bit more interesting! Read on to see what essentials I keep reaching for, and let me know what yours are! Though it’s definitely not warm enough to wear camisoles on their own just yet, I haven’t been able to stop reaching for these lacy pieces because they just add such a nice touch of subtle femininity to my knits. Whether they’re just barely peaking out from underneath a cozy jumper, or they’re worn as a top with outerwear to pull the whole look together, lacy camisoles are a definite wardrobe staple for me during these last few weeks of winter because they’re fun to wear and subtly hint at the warmer weather that’s to come really soon! Of course, no winter look is ever complete without a cozy cardigan, right? While I do love my coats, there are definitely days where I want to wear something a little more relaxed and easy to move around in, and this is when I usually reach for my cardigans. I love a cozy oversized fit or a longer and more drooping shape, since these give off a more effortless and casual vibe. Plus, they’re the perfect cover-up to wear on top of a lacy camisole, since they’re cozy, yet still give you the option to subtly show some shoulder for a less stuffy winter ensemble. While I love my skinny jeans, there’s no doubt that boyfriend denim has slowly been taking over my heart too. What’s not to love about the slouchier fit and the higher waist? Plus, when worn in a distressed cut, this adds the perfect touch of ruggedness to a feminine outfit, balancing it out for an ensemble that’s visually intriguing as well. Another big plus – a lighter, distressed wash stands out even more during the colder months, since most winter outfits tend to largely consist of a darker color palette. To finish off the whole look and pull everything together, I’ve been reaching for my signature black, floppy hat to add a touch of mystery and sophistication to my ensembles. While hats are usually reserved for the spring and summer, I find that this faux suede type of hat is perfect for the fall and winter, especially in a darker color, because it gives an ensemble an elusive vibe. What’re some of your favorite ways to dress when you’re bored of winter clothes? Let me know in the comments because I always love hearing from all of you! Thanks girl ❤ 🙂 I haven't been able to get enough of these jeans too! Aww all of your outfits certainly look so cozy. I knowwwww I’ve been disliking this dreary cold weather in LA that has came upon us. I want Spring to arrive already. Such a cool hat combo Elizabeth and it’s defintiely a good classy combo for the upcoming transition phase! I am always in awe at your style & stylish tips, Elizabeth! I’ve skipped the winter outfits all together because of this injury but I do look forward to spring and more fun/light looks! You always look amazing & so put together ❤ Gorgeous! Hahaha aww thank you so much Nadia ❤ 🙂 I hope you're feeling a bit better everyday! SO cute! Such great idea for clothing 🙂 Ready for Spring! Thanks babe ❤ 🙂 Glad you liked the post! Thanks babe ❤ 🙂 Glad you liked the look! I’m with you girl, so ready for the warmer weather! I love winter fashion, but I’m definitely ready for the winter to end! You cardigan looks so comfy and cozy! I wish the cold weather in LA would finally end so we can start busting in Spring fashion already. Loved the way you’ve styled your look! Such a fitting post for me right now! I’m so bored of winter fashion haha love that cardigan on you girl! Thanks babe ❤ 🙂 I can't wait for the spring too! And oh, it's from H&M! such a cute outfit! love your long sweater! Thank you so much babe ❤ 🙂 I haven't been able to get enough of it too! This was such a lovely post! I’m definitely over winter… can spring please come already? Anyways you look really chic darling! Hahaha yes, I can’t wait for spring too ❤ 🙂 Thanks babe! Great post, thanks for sharing! 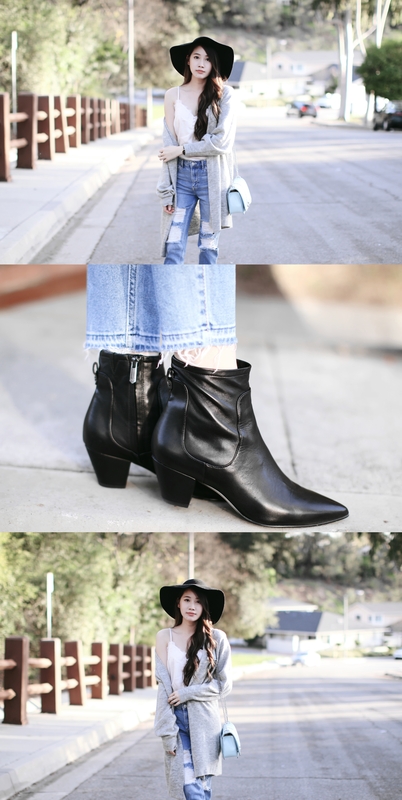 I am so bored of winter fashion so this post was amazing style inspiration! Yes, I can’t wait for warmer days too, Camille! This is an excellent way to transition from one season to another. I love how simple yet stylish it looks. What a beautiful hat you have there.